What? Winning a contest? Well, this is a never done thing. How did I do that? Running Goodman Games Dungeon Crawl Classics at a local FLGS. It all first started a few months ago when I was asked if I’d like to try a new RPG. The first time I played it, I was not impressed. I think it had to do with not understanding the fragility of the 0-level characters. But it also has to do with the fact that I’m relatively new to RPG gaming, so I lack the OSR background. Fantasy role-playing isn’t something I did as a kid. I had and have a good imagination, but I have lacked practicing my imagination over the past 20+ years. I enjoy reading books. I’ve tried writing a novel and have one in an unedited state. I love the imagination and the freedom to create stories. As I come across RPG gaming, I’m excited. I’m in the process of writing an adventure module. But, probably, like my novel, it will stay in an unedited state. Yet, I’ve introduced the first part and have players who have really enjoyed it. So, on to developing it more. 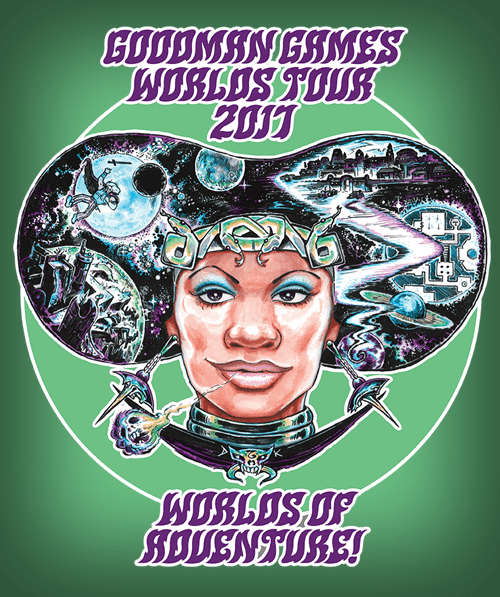 Goodman Games has World Tour 2017 and asks for Road Crew where you can order free swag to hand out at your DCC RPG sessions. They also posted a contest for GenCon 2017. All you needed to do was to schedule and report on DCC RPG sessions at your local FLGS. This is what I did and sent an email that I wanted to enter the contest. Nothing lost. Nothing gained. I gained! I recently heard that I was one of three contestants that won the GenCon 2017 package! With the package, I will get to run two DCC RPG sessions for Goodman Games. I’ve never been to GenCon. I have friends that are drooling over my win. And I have friends that have been there and are going again this year. I have lots to learn before I get there. This is so exciting! Now back to studying and planning! Just off the press! Goodman Games World Tour 2017 Contest drawing. I arrived at Secret Door Games in Elkhart, IN for the 4th session of Goodman Games World Tours 2017 to find I had eight RPGer eager and ready to play. I’d planned that we take around 30 minutes to do some learning on how to roll up 0-level characters. We made it through by creating 24 0-level characters. There were two returning players who had 0-levels ready for the game. As there were three returning players, and two of them had played “Portal under the Stars”, I asked them if they wouldn’t mind if we’d go through it again for the sake of the six brand new players. They were fine with that. And in the end, they had a great time going through “Portal under the Stars” again. Our players for this evening: Cam adventured with Markus, Marin, Barkley, and Morton; Marlene adventured with TomTom a navigator, Etsy a merchant, Chefaine, and Dikon a radish farmer; Kelly adventured with Johan, Sawyer, Cherry a cobbler, and Lunella; Ben adventured with Trying, Shako, Egan, and Richie a banker; Gretchen adventured with One, Two, Three, and Four (she said that she’d name the ones that survived. I guess giving them names was getting too attached to them); Dave adventured with Bumbag a farmer with a mule, Chick Chop a chicken butcher, and Roman Meal a wheat farmer; Matt advetured with Peter G, Joe S. Cleveland, and Glen C. (all baseball players, I believe). They managed to get through the portal and the first door without casualties. Entering the first room, though, two of the four spears shish kabob-ed Markus. The rest of the group, shocked to see the first fallen, were cautious about entering the room. Torches were lit and one at a time peeked through the door to take a look at the iron statues that just disarmed their spears. Off they went to the next door. Opening it, the see the marble floor. This room proved to be quite the challenge for them. The first to go through was trying and got a bolt of flame and lie smoldering on the floor. Again, the group began to look closely around the room inspecting what they could from the door. Roman Meal threw his goose in and they watched as the goose got fried. Wood pieces were thrown one by one into the room as the group tried to figure out how to disarm the huge statue of its ability to throw flames from its fingertip. After some time, without the group figuring it out, the flame-throwing finger died out. Roman Meal the wheat farmer had made it to the door on the west wall. He was the only survivor from using the door as a shield to protect from the flame-throwing fingertip. He, unfortunately, met with the snake and died of a snake bite. As the group was looking around the room and trying to climb the 30 ft granite flame throwing statue, the snake made its way into the room. After it attacked Four, the group turned on it and killed it. Not sure who ended up with its horn as there was a huge luting spree going on of the dead. The group made it to the east door, but once the door was open and they found it to be a crypt with bones, skulls and burial masks, they quickly closed the door and headed to the north door. Once in the north door, they found the pool with the glimmering light coming from the crystals on the floor of the pool. They quickly discovered that the crystal statues posed no danger. There were adventurers seeking treasure and began to take crystals from the bottom. As the bubbles came more and more, they left the pool to investigate the door in the corner of the northeast. To not give more away from the adventure, I will stay that this group works well together to get to the end of the module. In Memorium and may they RIP: Etsy; Dikon; Johan; Sawyer; Lunella; Markus; Trying; Richie; Two; Four; Limb; Roman Meal; Joe S. as they all went down seeking treasure and heroism. Tabling & RPGing: how gaming is Create a free website or blog at WordPress.com.